A woman of the evening, the Ohaguro-bettari. This yokai usually is seen around shrines late at night, wearing either an elaborate kimono or wedding dress, usually turned away or covering her face. From the back, she looks very beautiful, causing men (and maybe women) to approach her. When they do, she yells out "Gya!" and reveals a pale and ugly face with only a large mouth with rows of sharp, black teeth. She is typical of most Japanese Ghost stories with their shock reveal. Her story varies between being someone who sold her teeth to a teeth blackener or an unattractive woman who never got married and commited suicide, to a shape shifting yokai in disguise. Her teeth are blackened due to ancient tradition that married women would blacken their teeth to indicate their married status. 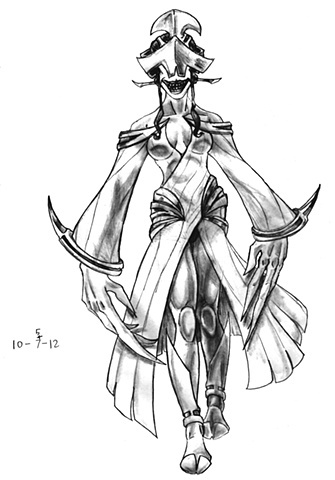 When designing the Ohaguro-bettari, I was going for a female Slenderman. I wanted to make the headdress like a part of her head, and used influences such as Hellboy 2's Angel of Death to Elesh Norn from Magic: The Gathering, while altering a traditional wedding dress into the outfit you see. I wanted to make the bone plates a form of wear for hear so that it unifies the faceplate.